The sculpture titled, “Growing Progress” was created by Michigan artist, Thomas Sheerin and is made entirely of recommissioned metal. The inspiration for the sculpture was to honor the Huhn family and their legacy in Grand Ledge from farming to selling Chevrolets. In 1919, Leo Huhn broke from the family’s agriculture roots and opened a Chevrolet dealership in Grand Ledge. Standing 10 feet tall and 11 feet in length, the base of “Growing Progress” represents a plowshare transforming into a wheat crop to pay homage to the Huhn’s family beginning as immigrants whose livelihood was based in agriculture. 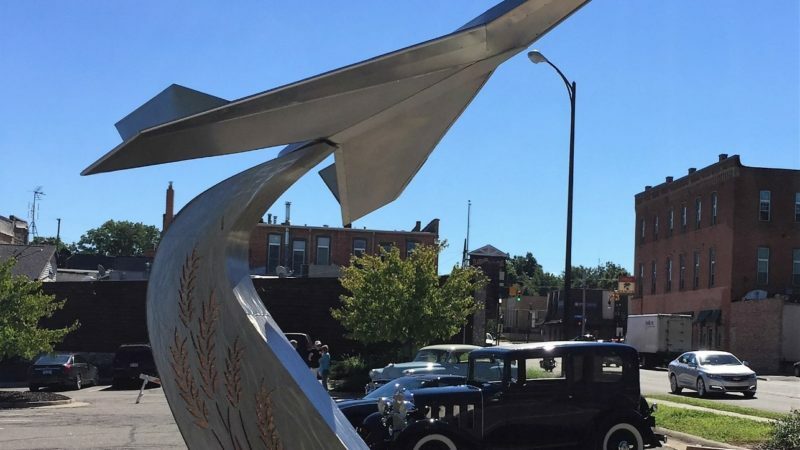 The top of the sculpture represents an eagle/jet-shaped hood ornament similar to a 1956 Chevrolet Bel Air and signifies the country post WWII, strong and growing into the Jet Age. The entire sculpture signifies that after years of war and depression, the country is looking up. The sculpture was donated by David and Nancy Huhn in memory of David’s parents, Victor J. and Rosella C. Huhn who were lifelong residents of Grand Ledge.